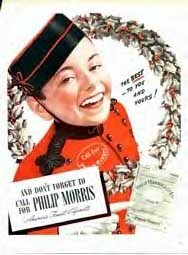 Last call for Philip Morris! Johnny Roventini, 88, the pint-size bellboy who became one of the best-known figures in American advertising with his shrill shout of "Call for Philip Morris," died Nov. 30 at a hospital in Suffern, N.Y. The cause of death was not reported. In 1933, he was being promoted by the New Yorker Hotel as "the smallest bellboy in the world" at 4 feet tall when he met advertising man Milton Biow, who had an idea for a cigarette ad. Biow gave him a dollar "to locate Philip Morris." In time, "Call for Philip Morris" was known to almost every person in the world. That began a career that brought Mr. Roventini a life contract. He was heard on popular live radio programs and on some of the most-watched television shows of the 1950s and 1960s, including "I Love Lucy," "Candid Camera" and the Red Skelton and Jackie Gleason shows.